There is an one-stop platform that purchasers from home and abroad will definitely visit, where you can sell your products on both domestic and overseas markets. The 16th Guangzhou International Hospitality Supplies Fair will be held in China Import and Export Fair Complex from Sept.7th-9th, 2018! As the representative and model of superior hotel supplies fair, HOSFAIR will keep serving hotel supplies industry. We will go on providing an one-stop solution and trade platform for purchasers and distributors from home and abroad to broaden the distributing channel. According to the prediction of World Tourism Organization, by 2020, China will become the largest tourist destination and the fourth largest export country of tourists origin. China is making greater and greater contribution to the world’s tourism, which enables Chinese market get more and more attention from the industry. Guangdong is the first economic province and tourist province in China. Guangzhou, the capital city of Guangdong Province, is the south gate of China, as well as the base for manufacturing, consuming, importing and exporting hotel supplies. In consequence, it possesses the ideal advantage in holding hotel supplies fair in September. Thanks to the policy of “the Belt and Road” and “Supply-side Structural Reform”, hotel supplies industry is meeting new development opportunities, which may bring lot of commercial opportunities to exhibitors. China possesses the largest-scale tourist market. The rapid development of hotel industry and the ceaseless demand for hotel supplies create a bright future for hotel supplies industry. The organizer of HOSFAIR invites manufacturers to exhibit and invites distributors and purchasers of well-known hotels to visit the fair in every edition of Guangzhou International Hospitality Supplies Fair in September. It aims to go with the latest trend and direct the development of hotel supplies industry. 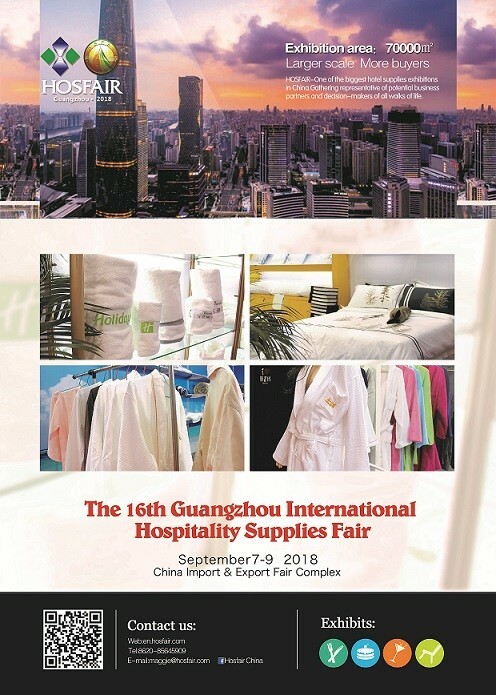 Guangzhou International Hospitality Supplies Fair is organized by Tourism Administration of Guangdong Province, China Hotel Supplies Association and Kitchen Utensils Chamber of Commerce of All-China of Industry and Commerce. In the same time, it is also greatly supported by hundreds of hotel supplies associations, hotel associations, catering associations, kitchen equipment association and so on. They organize their member units to take part in and visit the fair, aiming to make it an industrial pageant for communicating and trading. HOSFAIR will go on providing an one-stop solution and trade platform for purchasers and distributors from home and abroad to broaden the distributing channel. HOSFAIR has a great transformation to promote accurate matching service. Purchase requirement that buyers apply can be accurately matched with exhibitors and exhibits, which may help them find appropriate and satisfied suppliers. Exhibitors can provide buyer types they want, and then match the related buyers in order to make sure that suitable buyers will attend the fair and do some purchasing. Exhibition effect will be maximized through accurate matching. A series of theme activities will be held during the fair, such as Member Annual Meeting of China Hotel Supplies Industry Association, Member Annual Meeting of Kitchen Utensils Chamber of Commerce of All-China of Industry and Commerce and so on. In the same time, many professional activities will also be held, like HOSFAIR Cocktail Master Cup, Guangzhou International Coffee Cup Competition, CCL Cup Brewers Cup Championship (Guangdong, Hong Kong and Macao Division) and Stone Apply&Maintenance Summit Forum etc. HOSFAIR will hold high-end activities and boost the development of the fair by comprehensively propagandizing and elaborately organizing. Official website, Wechat public platform, Official Weibo, EDM. Advertise in more than 100 professional websites at home and abroad. Hundreds of thousands of newspaper will be delivered regularly in some hotel supplies markets throughout the country. Outdoor advertisements will be public in every professional hotel supplies and related markets, such as Xinji Shaxi Hotel Supplies Expo Center etc. Hundreds of magazines, more than 50 newspaper and TV stations will help propagandize the fair. There will be over 10 exhibition promotion seminars to propagandize the fair. More than 80 professional hotel supplies markets will help attract exhibitors and buyers. About 10 purchasing matchmaking meetings of new products will warm up the fair. Over 70 professional overseas cooperative media will constantly report news of the fair. HOSFAIR cooperates with 20 overseas hotels, catering and hotel supplies associations to organize visitor groups. HOSFAIR will attend more than 30 overseas fair to promote the fair. HOSFAIR will make full use of its database that has been accumulated for over 30 years to sincerely invite buyers. Kitchen equipment: stove, catering equipment, food machinery, heater, bakery equipment, refrigerating equipment, washing/sterilizing equipment, water heater, cabinet and ventilating device etc. Hotel furniture: suite furniture, mattress, catering furniture, outdoor furniture, painting, office furniture, decorative lighting, wooden furniture, theme hotel design etc. Hotel textile: Hotel uniform, bedding, towel, linen, carpet, curtain etc. Guest room & Lobby supplies: electric appliance, television, refrigerator, strongbox, luggage stand, umbrella stand, toiletries, signs, garbage can, disposable products etc. Clean & Laundry: cleaning machine & equipment, cleaning tool, cleansing water equipment, washing equipment, detergent, stone maintenance equipment etc. Intelligence & Entertainment: intelligent hotel system, monitoring equipment, security alarm equipment, smart door lock, registration identification device, video doorphone system, fitness equipment etc. Food & Beverage: coffee bean, instant coffee, espresso, sugar, milk, coffee machine, bakery machine, tea, ice-cream machine, wine, beer, cocktail, wine cabinet etc. Restaurant chain: hot pot, Chinese food, western food, fast food, condiment, frozen food, order system, instant food, canned food , food packaging machine, cash register, etc. Hotel design: decoration & design company, soft furnishing material, theme hotel & homestay etc. Under the support of all sectors of the society, HOSFAIR 2017 had come to a close. The exhibit area was more than 60,000 sq.m, attracting 913 exhibitors from 18 countries and 43,600 purchasers from 65 countries. Well-known exhibitors like Henglian, ITW, East, Southstar, Xingxing, Xingji, Ecomax, Fabbri, Bacardi, Taitang and so on participated in the fair. What’s more, exhibit groups also showed their appearance in the fair, such as Singapore, Italy, New Zealand, Poland, Thailand, Korea, France, Spain, Czech, Australia, Malaysia, Indonesia, Peru, Chile and Brazil etc. In the meantime, 43,600 purchasers from home and abroad were invited to visit the fair, such as Lingnan Group, Shangri-La Hotel, White Swan Hotel, IHG, Country Garden Phoenix hotel Guangzhou, AL DAU DEVELOPMENT, Hotel Investment Group, MLB CAPITAL GROUP, ACC Group, Noor Hospitality LLC, City Seasons Hotels, Reikartz Hotels Group, VJ GROUP and so on. We will go on invite more exhibitors to participate in the fair, so as to providing an one-stop solution and trade platform for purchasers and distributors from home and abroad to broaden the distributing channel. Contact: Guangdong Xinji Huazhan Exhibition Co., Ltd.
Online magazine for Textile, Clothing, Leather and Technology is a Media Partner of the The 16th Guangzhou International Hospitality Supplies Fair for Bulgaria.